Realistic Looking EYE RING. 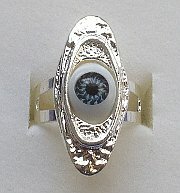 Interesting realistic eye RING. Adjustable size band, Silver colour. 24kt layered Yellow Gold Nugget design Mens heavy Ring. Supplied in Ring Size U. 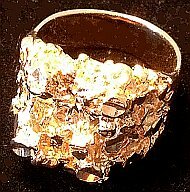 Large 24kt bonded plate Classic NUGGET GOLD style Ring, approx. 18mm width across ring top. Anodised colours Blue, Purple, Red, Green etc. Fashion Rings. Pack of 20 rings assorted. 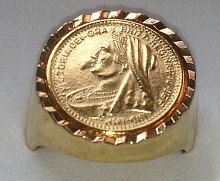 Heavy solid Gold plated tone Coin design solid band ring. Supplied in various sizes. Solid band Coin Ring. Pack of 24 x Gold tone Clear Cut Crystal stone set Rings. 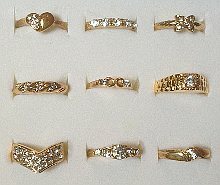 Assorted designs and sizes all set with Clear CZ Stones in Gold coloured bands. (Actual designs may vary from image example). 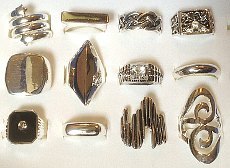 Wholesale Pack of 20 x Silver tone Assorted design Rings. Excellent assortment of Ring styles all in Silver colour, including some large designs, Fashionable styles etc. (stock may differ from illustration). Ben Sherman Stainless Steel Ring with Leather inset and Ben Sherman Original Logo. Titanium Mens Ring with brushed finish, 7mm gauge domed finish exterior. 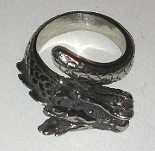 Large Dragon Head and Tail design Antique silver colour Ring, supplied in various sizes. 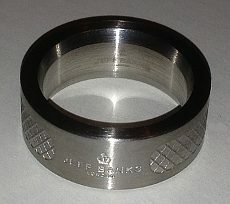 Large Mens solid Stainless Steel designer Jeff Banks London branded Ring. Wide 8.5mm solid heavy Gents Ring.